This post is inspired by my fellow bloggers’ writings in the Monthly Wine Writing Challenge #3, which just concluded and featured articles around the theme “possession”. A common thread in most posts was the idea of how possession of wines is only fully realized when they are consumed. But not just alone, but shared with friends, fellow wine lovers or loved ones (this theme hit me especially forceful in Anatoli’s entry as well as John, The Wine Raconteur’s piece)… My buddy Jeff, The Drunken Cyclist, posted something about how to deal with your wine possessions and I literally exclaimed in the comments section that the most important rule was not to wait for special occasions, in my view, a special wine IS the occasion on any given night. So let me reiterate: If you have a special bottle stashed away somewhere and you are still waiting for that right moment to open it, why not make tonight that night? 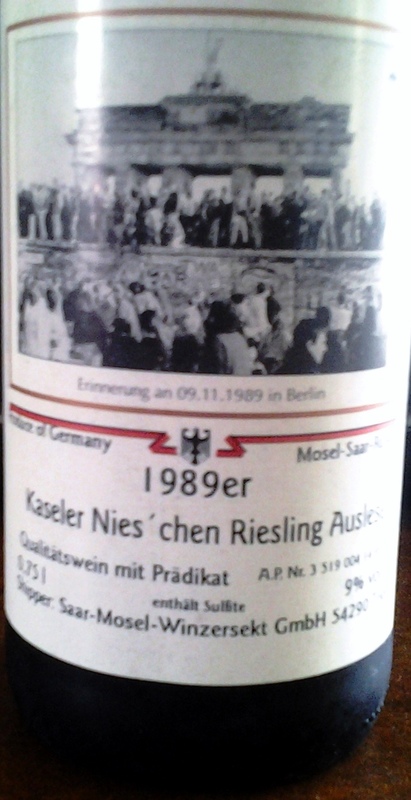 The articles inspired me to search my modest cellar for a special bottle that I had been keeping there for a while: A bottle of 1989 Kaseler Nies’chen Riesling Auslese (and its twin, I actually have two bottles of this wine). So much about this wine is special: I received these bottles in a special shipment from my friend ManSoo (who confided that this was at the time – spring 2013 – his favorite wine), the label itself is special (as you can see), the year is very special, especially for a German, and a more than 20 year old Riesling is special anyway…but label and bottle also caused some head-scratching, which I will let you in on in a minute. Very dear friends of ours had invited us for dinner, and I decided it was a great occasion to bring this wine because one of them loves aged Rieslings and the other loves Riesling of any kind. As I unearthed one of the bottles (yeah, my holdings are not very well sorted at all…), I paused and looked at the label. The photo of the Berlin Wall coming down is still giving me chills. To this day, 24 years later, I remember my dad calling my brother and me downstairs so we could see the live footage that fateful night of November 8/November 9, 1989 when the Berlin Wall came down. I remember his tears, although we didn’t even have relatives in East Germany. The next days were crazy, with teachers only talking about this, no matter the subject. It was all very emotional. So naturally, the label touched a very soft spot for me. But there is some mystery to this wine when you look closely. The bottle mentions Saar Mosel Winzersekt, a cooperative, as the wine’s shipper, not bottler. So the label was attached by the cooperative and is probably sold by the cooperative, but it was not made by it. Who made it? Then, while drinking the wine and looking at the label again, I realized that there was something else that was odd. I’ve written before about the AP number, a special number that needs to be printed on every bottle of wine produced in Germany. You can read more about it here, where I explained that concept in detail. But to cut things short: Every bottling in Germany gets a unique number and sample bottles of these bottlings have to be retained in order to ensure the quality and that no fakes are being made. The AP number’s last two digits stand for the year in which the wine was approved as wine. Usually, that is one or two years after the vintage. So for a 1989 you would expect to see a “90” or “91” at the most. 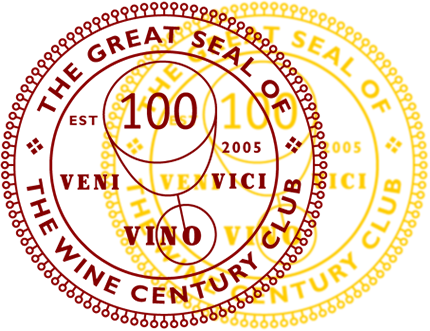 However, this label shows the digits “99”, which means it was only submitted for review and approval in 1999, ten years after the grapes were harvested! I love these detective instincts that labels can and wines can trigger. This was a special case, because usually it is confined to checking out the vineyard and winemaker, trying to see where in particular the grapes are coming from. This one had several weird clues, and I relished investigating them. There is so much to wines! hmmm, sounds like a theme for the writers’ series to me: investigation. Wonderful story. I like unanswered questions. There is a certain beauty to unanswered questions. Without them, why prod on? Great story, Sherlock! ;-) I also vividly remember the day the wall came down and the footage that was shown on TV that day. Really one of the turning points in modern history. Fascinating facts about German labels and bottle identification too. A really great story and I learned more about German wine – hadn’t heard of the AP number before. Fascinating. German labels can be so confusing…I wrote an article about how to read them here, forgot to link to it in the article. A great story, and I feel humbled to be brought into this story. I may have to let you borrow my deerstalker cap to further study this mystery. That’s why I didn’t figure out the ten year thing! Your cap would have made me get to the root of it. We all need more friends like that! What a great story! Cheers!! What a fun read, Oliver! Thanks for sharing. I agree with Anatoli – we want that 10-year gap filled in. What happened? Why? How? Thanks! I will continue my investigation. “I love it when my friends have one of my treasured Riesling moments.” Love that! Investigative wine journalism . . . I love it!! Open a bottle of wine . . . go down the rabbit hole. Great story!! Great piece, Oliver. I love this “investigative wine journalism” as you call it. I used to do a lot of it looking form the grape information for my Century Club adventures. It is a lot of fun. I will talk to my friend from whom I got the bottle to find out more. He is currently in Korea, so it might be a while until I can actually figure it out…but I am curious, too.